Thomas was an old man now, and he hadn’t gone shifting himself between one time and another for quite a few years, not since he’d gotten out of prison and left Minnesota for good. The world beyond the prison walls had too many people in it, and too much noise; and he thought that he had already done everything a man could do to finish the job that he’d been given. There wasn’t anyone left alive who could say different, that much was sure. He’d never met another man with his particular gift. Maybe there were a few who had the possibility of it, but if he were still the betting man that he had been in his youth, he would have wagered good money that no one else had been given—as he had been given, although much against his will—the extremes of quiet and seclusion that were needed to develop it. But in this year of Our Lord 1916, every day the papers brought bad news of the war that was raging in Europe—stories of British troops retreating from Turkey, of zeppelins attacking Paris from the air, of bloody battles on the ground in Belgium and France. Then there were the other stories that the newspapers didn’t tell, the stories that passed from one cunning-man or wise-woman to another like a river of hidden knowledge running underground. A woman in Paris, they said, had called up one of the great salamanders and imprisoned it inside a brass shell, and a man in the Ruhr Valley had learned the master-word that compelled the dark spirits of the mountains to craft for him monstrous guns of adamant metal; and it was only chance that had put them on opposite sides of the war and kept them from joining together to make a weapon more terrible than anyone had yet seen. And there were other stories like that, or worse, as if Europe were tearing itself to pieces and taking the rest of the world along with it. Everything he’d done before, he’d done in the name of preventing a dreadful future that he could only dimly perceive—the clear sight had always been someone else’s gift, not his—and he had trouble believing that what he saw happening now was the result of success and not of failure. He was oppressed by the fear that all the work he’d done had still had not been enough, or that he had, in spite of himself, done wrong, causing by his efforts all of the things that he had tried to prevent. He spent a great deal of time sleeping these days. It came, he supposed, from having lived so much longer than he’d ever expected to. By most men’s reckoning, he ought to have gone down bloody and bullet-ridden years ago—he’d certainly endured gunfire enough for it—instead of being well on the way to dying peacefully in his own bed. And in Missouri, no less, which was more luck than he probably deserved. The benefit of sleeping so much in his old age was that nobody was ever surprised to see him stretched out on his bed in the afternoon, with his eyes closed and his breathing deep and steady. They’d tiptoe away, saying “Don’t disturb the poor old gentleman; he needs his rest,” and they wouldn’t come back and bother him until supper time. That left plenty of room for a man like him to go traveling. It was a skill hard-learned. The boy who had first been shown the way had not followed it—he’d had too many other things calling to him, kin and country and desperate deeds, and a wild life outside the law. Not until the wild days ended and the law had its grip on him did he take the time to practice what he had been taught. Time, after all, was the one thing a prisoner had in abundance, and he had made full use of the time he’d been given. When he’d taken up the work again in these latter days, he’d tried going forward, further into 1916 and beyond, into the possible futures, good and bad, that he saw fanning out from the present. He couldn’t. He could see them, like faded photographs on the other side of a sheet of thick glass, but that was the outer limit of his agency. He could not move into those futures, or affect them, by which he understood that his time on earth remaining was short. He had known for a long time that he couldn’t shift forward beyond the end of his physical life in this, his native plane. If there was any part of his work that he had neglected or left undone, he would have to finish it now. He rose from his bed and stepped away from his sleeping body. The man who lay there, breathing steadily and deeply, did not look as he remembered himself looking when he rode with Quantrill into Lawrence, or into Northfield with Frank and the boys. This other man looked old and worn down and tired, even in his sleep, with a furrowed face and close-cropped hair gone grey. I wasn’t so bad looking once, he thought. Don’t think I could charm the ladies like I used to, not any more. He had work to do, and only a little while left to do it in. Moving away from the here and the now, he let himself wander through past years with no specific destination in mind, never staying for too long in one time or place. To an outside observer in any of those places, he might have seemed to flicker into existence and then back out again, if indeed his presence had been noted at all. But there was nothing anywhere that seemed likely to help him, at least not until he heard the voice speaking to him from somewhere deep in the many-layered past. Its Death Foretold in the Fever Dreams of Mary Todd Lincoln….As a great nation’s destiny is being written in blood on the battlefields of Pea Ridge and Shiloh, a grim tomorrow is foreseen by a deeply troubled first lady and interpreted by her best friend, Mercy, herself an accomplished seer. But hope appears out of the mist with the arrival of Thomas, a mysterious stranger with an astonishing mastery of time and space. Against the backdrop of the Civil War’s greatest events, these three must join together to salvage a future with the aid of unlikely collaborators: the uncannily gifted Confederate captain Cole Younger, his notorious career as a bank robber as yet undetermined, and President Lincoln himself, called upon to willingly make the ultimate sacrifice. 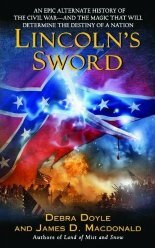 And the key to their desperate endeavor lies in a mysterious image from Mrs. Lincoln’s tortured visions—a magical sword which, when wielded, will bring redemption or destruction.